A short climb onto the Crown Terrace with panoramic views of the Arrow Basin. The Arrow Basin and Lake Hayes from the Crown Terrace. Lake Wakatipu is just visible in the distance. • By Matthew. 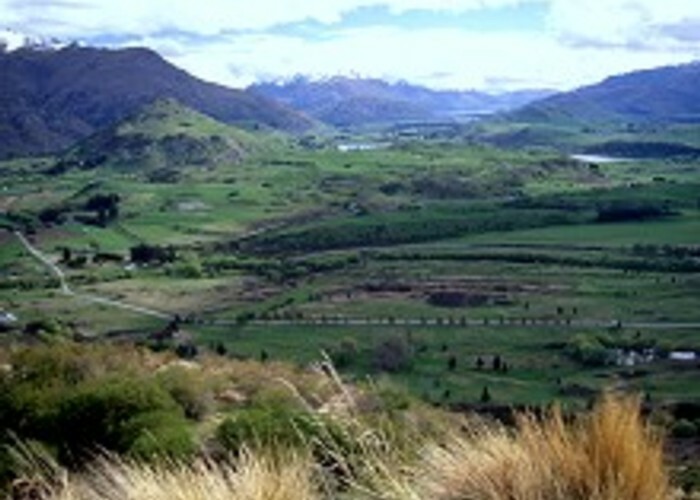 A smoothly graded climb onto the Crown Terrace overlooking Arrowtown, it is popular as an exercise trail for local residents. Dogs, mountain bikes, horses and 4WD vehicles are all permitted on Tobin's Track. California quail and skinks may be seen in the area. From the eastern end of Buckingham Street continue onto Bedford Street and take the next left, which is Ford Street. Ford Street meets an intersection with Nairn Street to the left and Criterion Street to the right. Opposite, Ford Street continues for a few metres as an unassuming dirt road. Follow it down to the grassy edge of the Arrow River, where vehicles can be parked. A vehicle ford and a swingbridge cross the river to meet the wide and smooth 4WD road that is Tobin's Track. The road climbs steadily up the terrace and away from Arrowtown, lacking the zigzags of the new road farther along the terrace to the south. Sycamores, willows, and poplars give way to shrubs and grasses near the top as the prominent hump of Mount Beetham is passed on the left. Eventually the track bends onto the terrace near a small trig marker. The view from here extends across the Arrow Basin, taking in Lake Hayes, the Remarkables, and Lake Wakatipu. The floor of this basin was carved by the ice of the Wakatipu Glacier in a series of glacial advances, the most recently being 18 000 years ago. Lake Hayes was once joined to the Frankton Arm until the outwash delta of the Shotover River cut it off. Added 1 June 2001 by MatthewMatthew. 2 revisions, most recently 10 December 2016 by MatthewMatthew.